Art is a complex and subjective thing, and we all have different takes on music and paintings and clown dog sculptures (I'm against them). Sometimes, however, artists aren't always thinking of the real world implications of their projects, especially with things like humans and physics getting involved. And on rare occasions, those things meet in just the worst way possible. Sort of like clown dog sculptures, I guess. Like with art, the concept of beauty itself varies from person to person. Maybe your idea of eye-pleasing phenomena consists of elaborate murals sporting a plush landscape filled with trees, a river and all sorts of wildlife. Perhaps it's the glorious power and majesty of a thunderstorm, with its lightning and thunder and rolling clouds. Or it could just be some super attractive buttocks, which my girlfriend assures me I have. One Lee Bul wished to examine the very nature of what we find beautiful, or rather question it. Specifically, he wanted to explore "the fleeting nature of beauty for highly ornamented women." So basically, how pretty a woman is based on her fashion accessories, I guess? Look, I'm not an art aficionado -- I'm just spit-balling here. What Bul landed on for an idea was taking a bunch of dead fish, then threading them with beads and sequins to convey the message that "Feminine desirability is a social construct that makes few allowances for corporeal deterioration." But he did this with putrid, bedazzled fish, that were at least stored in plastic baggies, because some effort should be made to cover up the stench of dead things. Holy crap, that fish is HOT! Unfortunately, it didn't work that well, which caused it to be removed from one installation at the Museum of Modern Art. After that, Bul added the stink-preventer potassium permanganate to the equation, hoping it would solve the problem. It didn't. See, when you add chemicals to a rotting carcass that's already releasing other chemicals, it turns into a super fun chemical party that can produce some pretty explosive results. Quite literally, in fact. Which everyone became acutely aware of when that funk-reducer mixed with the funk-releasers and just straight up exploded. You're probably picturing a pressure-based explosion like an over-inflated balloon, but I'm talking about the kind of explosion that comes with fire. Fortunately, it was fairly minor, causing minimal damage. They still removed the display after that, though, because if dead, stinky fish isn’t enough to deny your entry into an art exhibit, an explosion definitely is. Back in 1971, an exhibit dubbed Bodyspacemotionthings, which sort of sounds like a ridiculous title for a cheesy '80s exercise video, made waves at the Tate Gallery in London. It consisted of interactive sculptures, like balancing on a giant ball while holding on to a rope or pseudo-see-saws that were basically nothing more than giant boards placed on cylinders with nothing holding them in place. As one with any knowledge of basic physics and human clumsiness might predict, people got hurt. Because duh. You can't just unleash the general public on a posh version of Jackass and expect things to go swimmingly. People got splinters from the unfinished wood, tore muscles and sprained things. Sure, part of that was because people are people and didn't follow the instructions that were plainly visible on how to interact with the project. But realistically, you also don't let your kids loose into Chuck E. Cheese assuming they're not going to try to land a flying elbow on someone in the ball pit. Predictably, it got shut down. Nope. No impending injury here at all. But in 2009, the choice was made to try the project again, this time with some additional safety measures in mind. Yet despite things like sand bags and stop blocks in place, it turns out that letting people romp around an extremely crude obstacle course still carries some danger, regardless of its artistic relevance. You can't just roll people around in huge wooden cylinders and not expect at least one injury to occur. And there was, or rather, there were more than 20 in about a week. Kids cracked their heads and crushed their fingers, suffered cuts, bruised bones and got rope burns. It was a mess, which is probably why they decided to ... run it for two extra weeks past its initial four-day commission. That makes sense, actually, because I'm pretty sure nothing represents the beauty of artistic expression like hospital visits. 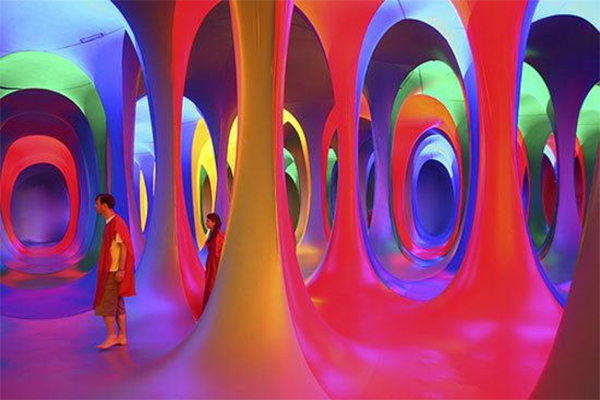 For years, Maurice Agis had been making enormous, walk-through, inflatable art installations that dazzled visitors. They were described as "very womb-like and trippy," with lots of eye-catching shapes and lights and colors. Which is maybe like Alice's adventure down the rabbit hole, at least visually, only with way less shrinking potions and tea involved. And probably no Jabberwock. To some, it resembled a gigantic bouncy castle of sorts, though considerably bigger and not much on the whole bouncy front. Others saw it for what the artist intended: an enormous, abstract work that appealed to the senses. Unfortunately, no one saw it for what it was to become: a flying murder vessel of absolute terror. Though, to be fair, a very pretty flying murder vessel of absolute terror. The Dreamspace installation took to the sky, with people still inside. Agis even ran after it as it snapped ropes and lifted off, grabbing on to it in a desperate attempt to bring the thing down and save the people inside, he himself flying along with it. Tragically, the air-filled exhibit continued its ascent, resulting in the death of two and injuring many more. Now, I'm not a fan of traversing dark territory, and telling this story makes me feel a bit icky inside. But I still can't help but think that maybe looking at the weather forecast to see if wind might ruin your huge, inflatable art project might have been an important step in preventing this tragedy. Art is all about presentation, whether that's choosing a wall to hang your painting on or which brand of baggie to use to store your dead fish. It's also probably prudent to ensure that when planning your installation, you take steps to protect it from things like the elements and general human clumsiness. Simon Birch, who didn't consider the latter, set up some crowns on a bunch of pedestals in what was effectively a domino sequence, eternally optimistic that they wouldn't fall down as such. Neither the artist nor the museum bothered to rope it off, either, with Birch saying, "We trust people." Surprisingly, even after the mishap, no extra measures were taken to protect the project going forward. Birch even said, "Crowns are fragile things. They are symbols of power. Perhaps it's ironic and meaningful that they fell." Yeah, perhaps. But come on. Some artists have an uncanny ability to create works that are incredibly realistic, like maybe a painting that could be mistaken for a photograph or a person that looks like a statue. Anish Kapoor's installation Descent into Limbo is the exact opposite of that, consisting of a very real hole that looks completely fake. You can almost picture Wile E. Coyote pulling this thing out of an ACME box and plopping it down in an attempt to trick the Road Runner. It's completely black, giving no indication that you could fall into it and down toward horrible injury eight feet below. Except for, you know, the waiver you had to sign and all the posted warnings, plus someone inside to remind everyone of this fact. They forgot to post a "FREE BIRD SEED" sign with an arrow pointing down. Still, you're really testing the bounds of human curiosity by putting something like this on the floor. Unsurprisingly, someone did actually fall in. Though maybe it is surprising, given that Descent into Limbo has been a thing since 1992 and this is the first time anything like this has happened. If I'm being completely honest here, 26 years is probably a pretty decent track record for not having someone fall into your fake-looking cartoon hole. And to be fair, it is rad as hell. I wonder if we could commission Kapoor to come install one of these at the new Modern Rogue HQ. Like this article? Check out "5 Badass Versions Of Otherwise Mundane Jobs" and "5 Times That Suspected Cheaters Weren't Actually Cheating".